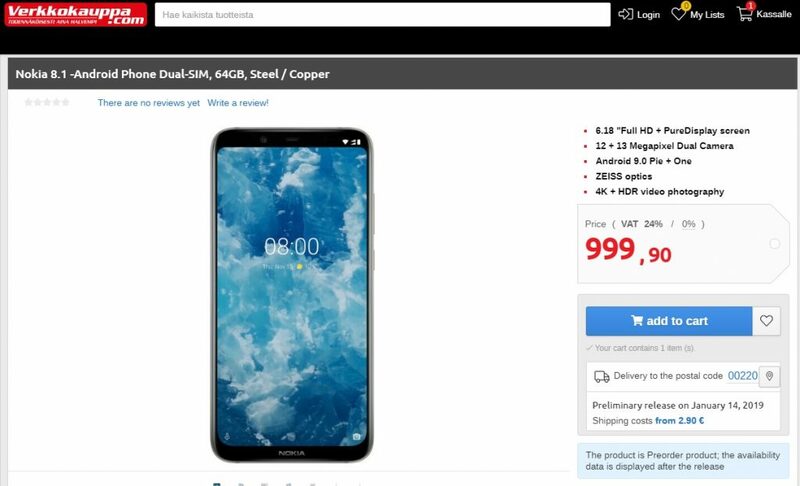 Nokia 8.1 is available on preorder in its country of origin, Finland. Actually, the country of origin is China, but the return address at the back is in Finland :). Finnish retailer verkkokauppa.com just announced the preorders at its web pages. They are selling the Steel/Copper color variant with 64 GB of internal memory. The price mentioned there is not real, I hope. Hardly anyone will overpay almost €600 for a smartphone (maybe iPhone lovers would), but the real thing on the page is the delivery date and shipping costs. Verkkokauppa says that Nokia 8.1 could be delivered on January 14th of 2019, and shipping cost will be from €2.90. If you are interested in this device this could be as early as you can get it, even though I would wait for Verkkokauppa to put the real price on its web pages.